On many occasions one might run across some description of the Hellenic gods with some aspects being a dark face of the god. This seems to be related largely with an idea that the gods and nature possess duality, and therefore many get stuck on the idea of light and dark, male and female, sickness and health…everything with opposite forces. Even in Hellenismos there is a belief that beside Zeus there are two containers from which he equally distributes bad things along with the good. However, it seems to me that this idea of a “dark aspect” is by its nature flawed for a few reasons. For one, nature in itself does not possess distinct duality. There is really nothing within nature that truly dark, with the exception of perhaps a Black Hole which devours all light. I have seen photos of our own planet, which via special photography, even when turned away from the sun still show the light from the sun, while being intensified on the side of impact, spread around the circumference of the planet. Which also includes the aurora borealis from the solar flares which can be seen in the night sky. This is not, of course, including the fact that the moon acts as a mirror which reflects the rays of the sun, or that our sun itself is a star like all those which light up the night sky. At most we can probably say that with the absence of the sun’s direct light, while interfering with our visibility as a diurnal species, makes us more aware of the subtle lights that are always around us. Just as there is no real division of light and dark in nature, there is also no good and bad. Storms, earthquakes, torrential rains, bacteria, disease. These are all part of nature and have no good or bad quality assigned to them. Here is where we must distinguish between what is preferable for our happiness, and what is just a necessary part of nature. Which brings me to my second point. Our ideas of good and bad are established by comfort and preference rather than any established truth in nature. But because that these are based on our happiness and what pleases us, it means that the perception itself is flawed. Things that we enjoy aren’t always good for us, and things that make us unhappy and struggle are often necessary. Therefore it seems like this idea of the jars of Zeus which distribute good and bad to the lot of men, it is a metaphor to the even distribution by nature and necessity. So then what is darkness? It is not a natural condition but a spiritual and mental condition. Nature, and therefore also the gods who are beings who live within and abide by the laws of nature, cannot be dark..it is infused with life-producing light. Therefore the gods too are divine beings of light (which makes sense when compared to how marble and gold has been historically used in the depiction of the gods) and generally speaking cannot be dark as the highest expressions of the functions of nature. Darkness would then be that which is contrary to nature and to the gods. For example ignorance and superstition has been depicted as being dark places of the mind which rules people by the instrument of fear, and is by its nature unreasonable and contrary to the forward progression and evolution found within nature. Similar instances can be associated with unreasonable actions, such as murder, for the sake of greed. When people are inflicted with this kind of internal darkness, it has nothing to do with the gods (though it is sometimes embodied as a being which the gods fight against) but is entirely opposed to them and draws to itself the consequences. Therefore Apollon, as a god who sends the plague against violators as a vehicle to bring awareness of the situation to the forefront, is also the god who dispels it once people have realigned themselves. It can be said that by sending the plague the god is far from being dark, but being an illuminator of the darkness that has come into the minds and therefore actions of the people. Therefore darkness is something that we most be conscious of within our selves and manifesting within our societies (often because of corrupted people in positions of power). We are responsible to check it and remove the influence in order to restore harmony and balance with nature. The gods and nature however are not dark. Of all the epithets of Apollon this one is perhaps the one which is more cherished in my worship of him, Apollon born of light, Apollon the wolfish god. 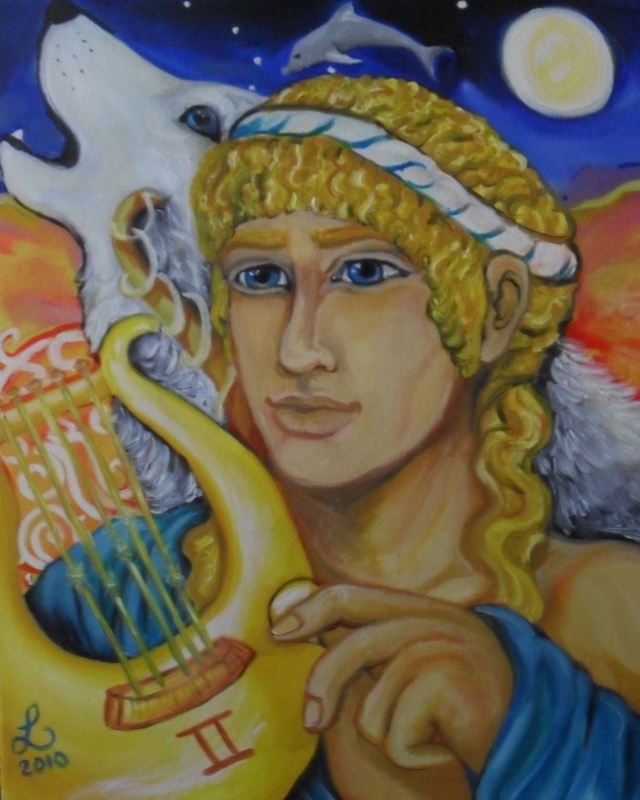 This is the vision of Apollon that I first loved, the wolf-king who shines like gold as white light ripples on his fur. When I was young I once had a dream that I was gowned in white and alone in the forest seeking. Beside me I had a silver wolf at one side, and a black wolf at the other. I was lost in the forest and then I saw a great wolf white as snow with eyes that burned with blue light that the very heart of a flame, or the sunlit sky, and when he sang the song peirced through me and drew me to him. And so when I discovered Apollon my first images of him that I painted were of a man with the golden head of a wolf, and at his side these two wolves of my dream, and light surrounded him as blue fire was contained within his gaze. And this was my first love of Apollon. Lykeios is a powerful epithet of the god as it refers at once to the entirety of his nature as I see it. The wolf is a creature of twilight, that period of time which stands intermediate of night and day and all the lights of these two periods: sun, the moon and stars. The morning twilight is called the wolf’s light, or false dawn for a purpose, the sky lightens with no visible presence of the sun as the world begins its transition to day. The far reaching rays of the sun have lit the sky, but still visible are all the bright orbs of the night. And so this period contains all the light of Apollon, he who was born on Delos, the starry Titanide Asteria, who is honored at the first lunar light of the new month, and dispenses the solar rays of the sun. The wolf is also one of nature’s greatest singers being able to create among them a harmonic chord of such beauty that the sound is like a dancer shifting in sways steps through the air. And the wolf is a destroyer, which is aligned to the originating meaning of Apollon’s name, as destruction is a measure in returning balance and purification, as well as renewal and evolution forward. The wolf is also a social animal, caring for the members of its pack and each with loving patience tending to the young of the collective social group which is a great symbol for a god who loves humanity, especially the children whose images have been found in devotional images to him, and who pled with his father on our behalf in myth that all humanity not be destroyed. The wolf is the light, the light is the wolf, and it is all at once Lykeios, the summation of the most primary nature of Apollon, he who is born of light. And though I have long lost the first painting of Apollon Lykeios, it having been swallowed up in the belly of Hurricane Katrina, I have another that hangs above my bed as a constant reminder of the power and affection of Apollon in our world. When I wrote Crowned with Nine Rays I had been playing with an idea for a completely new modern ritul to honor Apollon Hyperboreios. A winter festival celebrating the god from afar, but I hadn’t pinned down exactly when to celebrate it suggesting vaguely that such a festival could be celebrated in January ideally or perhaps February. These are often the coldest and bitterest months of winter until things begin to warm up again at the end of February and beginning of March. Especially Jauary. Back home in Alaska January was midwinter. If December marked the official beginning of the three months of winter with the winter solstice, then January must be midwinter. Of course in Alaska, during my childhood, it snowed most of the autumn too lol. But every year in November lasting through until around March the city celebrated a festival of lights to combat the dark months of the year…keeping in mind that in the far north when we are speaking the darkest months of the year we are literally talking *dark*. As in the fact that during December and January you will not see much of the sun, and if you are indoors during the day it is guaranteed to be dark in the morning when you leave the house and be dark again by the time you leave to head home again. The Festival of Lights as it was dubbed was the combat the seasonal depression that many Alaskans experience with such long periods of darkness as the earth has tilted away from the sun and Apollon is afar from us. But as the new year is part of this dark, cold period of winter…and is the vehicle of the new year by the modern calendar that most of us follow, it seems appropriate to honor Apollon Hyperboreios with a festival of lights on new years day. I say New Years Day instead of New Years Eve because I don’t see this akin to the solstice rituals in which lights are lit in honor of the sun that is to reborn on the solstice day, but rather that lits can be lit…..and colorful paper latterns would be idea as a symbolic representation of the aurora borealis (the norther lights) that dance playfully in the sky. So we may draw up the colorful lights in honor of Apollon who is afar, the bringer of the new months as Apollon Noumenios and therefore also appropriate to associate with the new year too. That his light graces the dawn of a new year, a new hope, a new beginning as we await his return in the spring. After all Apollon as god of the boundaries, who turns the cycle of the moonlight to rebirth the month again and again, he turns the wheel of all nature and life in harmony to his music…the axis about which it all spins. He greets at the passage with his torch held high, bringing in always the new from the death of the previous. Let his light herald a bright new year and that we celebrate it and honor it with all the hope in the world. Like every year I will be beside my daughter as we count down the minutes to the new year…probably watching the ball drop in New York Times Square, with our sparkling grape juice in hand. And then welcome with cheer the dawn of the new born year. The light of promise for each of us to hold dear. Of course people celebrate the new year…because the new year represents the best things that we can hope for. It is a time to wipe the slate clean, to start over, to be reborn ourselves. And of course to set resolutions of how we may improve ourselves and become more and better than we hae been before. Therefore tonight I shall cheer the dawn of the new year with my family and tommorow morning I shall pray to Apollon, and set up lights for him and honor him throughout the morning in celebration of Apollon Hyperboreios. And so I will conclude this post by wishing everyone a truly happy and blessed New Year. May we receive all the blessings and joy as we may find it and cherish it in our lives. There is an amusing activity that I liked to involve myself in from time to time in which I play with light. Or rather the reflection of light. I have done certain meditive practices looking directly in the heart of a flame, but that rather messes with my head and usually ends up with some partial vision loss while my eyes adjust to looking at a normally lit space. So as fun as it is stare into a flame as a focus, I have decided many years ago what my preferred practice was. I took an abalone shell (and being from where I am from that was never a problem finding one of them) though I am certain a dark ceramic bowl would work just as well but I prefer my abalone. I took special care to plug all holes in the shell by coating the entire bottom of the shell with a thick layer of wax. I then filled it with water and set it on a table. Next to the shell I set a candle. Just one candle will do. Position the candle so that the flame can be easily seen reflected on the water. Now the reason I love abalones so much is that they are endowed with a natural coloring in the inside of their shells that is multi-hued. Therefore the light is playing against these hues contorting them through the water. I just relax my mind and watch it and see where my imagination leads. This is not all that different from the way I used to watch leaves as a child moving in the wind from the treebranch with a restful mind to catch images formed within the movements of the leaves. The game with light is just more convenient. I often do it as a before bed activity.